Not all welding takes place on the factory floor. Just as often, welders are on the move and that means their equipment has to move with them. Portable welding machines make on-the-go welding possible. Source those welding machines in Mississauga at Josef Gas. We are the only source you need to create a successful mobile welding business! Portable welding machines are used in many different applications. They can be found on the shop floor, on construction sites, at pipelines, and even underwater. They are used by small and large businesses that bring their welding services to their customers. One thing all of these locations have in common is a demand for welding machines that are lightweight, durable, and reliable. heat sensing features to prevent overheating. monitors to keep tabs on the current and voltage. modern ergonomics for ease of handling. wireless technology to reduce the number of cords needed. auto-sensing features that automatically adjust shielding gas needs based on data like material, thickness, and wire diameter. Keep in mind that all portable welding machines need a power source. Some portable welding machines can be plugged into power outlets, but for areas where there is no electrical power, you’ll need a standalone power source. Diesel or gas powered generators are often used because there is such a wide range of options as far as voltage, size, power, and fuel demands. You can size the generator to power not just the welding machine but also plasma cutters and other power tools that may be necessary for the job. There are many features that are consistent across portable welding machines but that doesn’t mean that all machines are the same. You still need to do your research and choose the best machine for your business demands, transportation capabilities, and budget. That’s where Josef Gas can help you. We have a team of welding experts on staff who would just love to discuss your challenges and build a solution. We work with all the major welding equipment brands to identify the absolute best products for your welding needs. Call us at 416.658.1212 for all your portable welding machines needs in Mississauga. 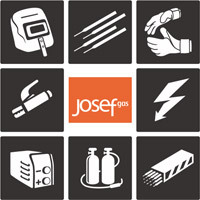 Visit www.josefgases.com to learn more about our welding experience.